Directed by: – Steven Caple Jr.
One of my favorite films of recent memory is without a doubt 2015 sleeper-hit Creed. A film that was simultaneously a spin-off and a continuation of Sylvester Stallone’s legendary Rocky franchise that has won the heart of moviegoers and inspired all of us to keep fighting despite the series varying degrees of quality. After a nine-year hiatus from what we thought was the final film at the time Rocky Balboa (released in 2006), the world was re-introduced to the Rocky franchise in the guise of Creed, a loving homage to the original and a breath of fresh air as the mantle Balboa held was being passed on to Adonis “Donnie” Johnson Creed (portrayed by Michael B. Jordan), the illegitimate son of Apollo Creed, a heavyweight champion and former rival turned close friend of Rocky who tragically died on the ring in Rocky IV (Spoiler alert for a 33-year-old film). Despite never knowing the man, Donnie embodies his old man’s fighting spirit and passion for boxing and sets out to Philadelphia, the home of Rocky who is arguably at the lowest point of his life as his wife Adrian and best friend Pauly are long gone. He has also lost contact with his son and he was about to get embroiled in a nasty battle with cancer. Rocky with nothing left to lose at this point reluctantly becomes Donnie’s trainer and the two develop a father and son relationship that enables Rocky to be whole again and gifts Adonis with a father figure he desperately needed and helps kickstart his professional boxing career which enables him continues his father’s legacy whilst building his own identity. 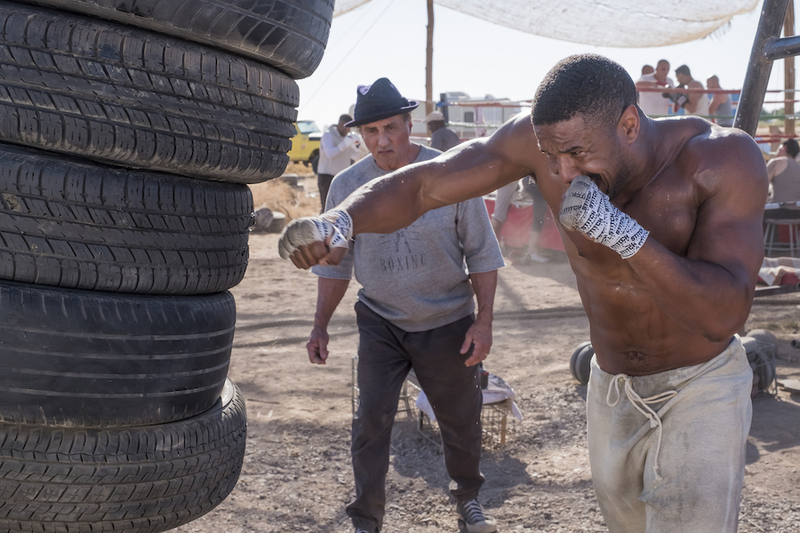 Adonis Creed (Michael B. Jordan) & Rocky Balboa (Sylvester Stallone) are back in the ring. Creed II picks up three years after the events of its predecessor, as Adonis Johnson Creed (Michael B. Jordan) is now on the precipice of becoming the new heavyweight champion of the world after a string of victories following his loss to “Pretty” Ricky Conlan at the conclusion of the original. He is also ready to take his relationship with longtime singer-songwriter girlfriend Bianca Taylor (Tessa Thompson) into the ring of marriage. Just as things are finally in Donnie’s corner a horrible shadow from Rocky’s and the Creed family past rears its head in the shape of Viktor Drago (Florian Munteanu), a Russian boxer based in Ukraine who is slowly climbing the ladder. He is trained by his father, Ivan Drago (Dolph Lundgren), a former Soviet prize champion boxer who years prior to the events of this film killed Adonis’s father in the ring during an exhibition match and was later defeated by Rocky. In a bid for revenge for his father’s humiliation following his loss, Viktor challenges Adonis to a fight. Adonis in a bid for revenge decides to take on Viktor but he is shocked to learn that Rocky doesn’t want a part in this fight as he tries to convince Donnie that he has too much to lose indulging the prospect of vengeance. Adonis is now facing his toughest challenge yet that easily raises the stake and could threaten his new family life as this match-up will leave him asking what is he really fighting for? Donnie and Bianca (Tessa Thompson) share a moment after a fight. Like the challenge Adonis faces, there’s already a lot going against this film due to the fact that Ryan Coogler who masterfully directed the original Creed is not in the director’s chair this time as a result to his commitment to Black Panther (Michael B. Jordan also starred in the film). In his place is Steven Caple Jr. a Cleveland native whose credit include directing a few episodes of Grown-ish and a feature-length film called The Land. Can the cast and crew deliver another knock-out performance or is this fight where this long-running franchise loses the belt in the vigorous circuit of sports dramas? One of my biggest concerns about the film that it was going to jump the shark the second half of the original Rocky films did and enter into the wacky valley (although I still appreciate the films as they are a guilty pleasure). Despite the higher stakes the film presents, the movie decides to take the sensible root of consistency and still be a relatively grounded affair like Creed was as it doesn’t inflate the ego of Adonis but rather focuses its effort on asking why our hero and villains are fighting. Like the original Creed, Creed II manages to respectfully take out pages from the Rocky films whilst forming its own identity. The movie this time around take story beets from Rocky II, III and of course Rocky IV. Thankfully the bombastic nature of the aforementioned Rocky IV is only reserved for the film’s fight sequences which enhance the spectacle. Caple and his team still manage to bring its own flair that grounds the experience in a similar manner Coogler did in the previous iteration as the film carries over the hip-hop motif of the previous film and combine it with operatic moments of Ludwig Göransson’s score to create sounds that are once again new and exciting and also a great service to the past. Like the original Creed, the movie lives and dies on Michael B. Jordan’s performance as Adonis. Michael B. Jordan passes the test in flying colors. Jordan once again portrays Adonis as a likable and humble fighter who wants to build his own legacy whilst respecting his father and Rocky’s own. The film makes the brave decision to focus most of its story efforts on Jordan which as a result allows the audience to delve deeper into Adonis’s thoughts and anxieties about who he is and whether he is truly a champion. This, as a result, gives us one of Jordan’s most memorable performance in a career that is already littered with glowing highlights. Stallone once again comfortably slips into his Rocky persona as he delivers another great showing as the Italian Stallion who is a lot wiser and more regretful of his past actions this time when Drago enters the fray. He still has a personal arc to resolve in this film but on this occasion, he takes the backseat so that he can allow Jordan’s Creed to take the helm. The sequel asides from having to develop Rocky and Adonis’s relationship also has to take its time to see his relationship with Bianca grow. Once again, the film succeeds thanks to the great chemistry that Jordan and Tessa Thompson share. Their growth as a couple provides the film with its warmest moments and the Thompson once again proves to be the natural evolution to the supportive wife archetype as Bianca shows herself to be an independent and successful woman who wants to take her already successful career to the next level and she challenges Adonis to be better at every turn. Phylicia Rashad reprises her role Mary Anne Creed, Apollo’s widow and Donnie’s stepmother who understand the life and mentality of a boxer. She has a bigger role this time as she gets to interact with Rocky and Bianca and anchors some of the film’s most important moments. The film addresses the biggest issue I had with the original film being the lack of a memorable villain/opponent. The film’s decision to use real-life boxer Anthony Bellew was understandable, but from the standpoint of an acting performance, it didn’t hold a candle to the likes of Apollo Creed, Clubber Lang, and Ivan Drago as he was pretty much devoid of an actual personality. Creed II rectifies this problem through Ivan and Viktor Drago. While Ivan takes a back seat this time like Rocky, he is still an imposing figure who is finally given more words to say other “If he dies, he dies” or “I’ll break you” and actual motivation which doesn’t make you outright despise but empathize with him. His son Viktor is really like a carbon copy of Ivan in his youth as he is a man of few words but also one who is armed earth tremoring punches that can break lesser men as Florian Munteanu brings a high degree brutishness to the role and is a genuinely intimidating foe that makes the audience question whether both fighters are in the same weight class and it will also leave you asking how on earth is Adonis going to beat him. Viktor (Florian Munteanu ) and Ivan (Dolph Lundgren) Drago seek out Creed. If you are expecting any twists to the narrative prepare to be disappointed in this regard as the film takes no substantial risks to mix up their winning formula. That means you are still going to get the same plot points right down to the inspirational training montage. That being said, the formula has been executed so well thanks to creative direction and awesome performances all round that this particular point of criticism is almost moot. While I respect and enjoy the film’s grounding of the franchise most cartoonish villain, the film misses a great opportunity to take further steps to flesh out this part of the story and may leave fans of the Rocky franchise asking what really happened during Ivan’s downfall. On a technical level, the movie just doesn’t hold a candle to its predecessor barring the climactic battle between Adonis and Viktor Creed there aren’t many if any fights that will leave a lasting impression the way Ryan Coogler’s single-take boxing sequence in Creed II’s predecessor did. Creed II makes all the right moves and executes its game plan effectively as its casts perform their roles excellently and the film’s vision that is much bigger and louder doesn’t lose sight of what made its predecessor a hit. Caple makes an admirable attempt to surpass Coogler’s opus but, it ultimately loses the battle against sequelitis. However, like a true champion, it wins the respect of the audience and wins its place in the upper echelon of sports dramas. A highly recommended watch.